Chris has been honored as one of Richmond’s Top 40 Under 40 by Style Weekly magazine, as a Virginia Super Lawyer Rising Star from 2008-2011 and Super Lawyer from 2012-present. He has also been listed as one of Virginia Business magazine’s Legal Elite, for intellectual property law. He is a 1995 graduate of Wake Forest University, and a 2000 graduate of the University of Virginia School of Law. 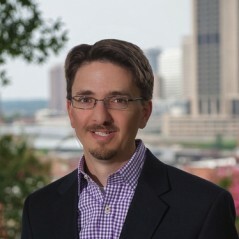 Chris has written on legal topics for publications including ZDNet.com, SitePoint.com, Richmond Grid magazine, the Virginia Business Law Bulletin, and the Richmond Times-Dispatch. He has spoken to many audiences, university classes, and professional associations about legal topics in his areas of practice, and has presented continuing legal education seminars to attorneys throughout Virginia on topics including intellectual property and social media law. He is also the founder of Name Warden, LLC, creator of a web-based practice management product for trademark professionals, and the instigator of RVA’s 804ork project (see 804ork.com).